If you're thinking about buying an Xbox One, here is everything you need to know. The Xbox One is Microsoft's 8th-generation videogame console and follow-up to the original Xbox and Xbox 360. It was released on November 22nd, 2013 in Australia, Austria, Brazil, Canada, France, Germany, Ireland, Italy, Mexico, New Zealand, Spain, UK, and the USA. In September 2014 it launched in additional markets including Argentina, Belgium, Chile, China, Colombia, Czech Republic, Denmark, Finland, Greece, Hungary, India, Israel, Japan, Korea, Netherlands, Norway, Poland, Portugal, Russia, Saudi Arabia, Singapore, Slovakia, South Africa, Sweden, Switzerland, Turkey, and the UAE. The Xbox One hardware currently comes in a couple of different bundles. Microsoft ran a promotion in late 2014 that offered a $50 price drop on Xbox One hardware. That promotion was so successful, it has become permanent, which s reflected in the prices above. There are Xbox One hardware bundles with up to 1TB hard drives. Many bundles come with Halo: Master Chief Collection and possibly other games. In Fall 2015 there will be a Madden 16 bundle as well as a Forza 6 bundle. Systems now come in black, white, and even blue for Forza 16. There are a couple of variations of controllers available as well. Most systems shipped with a new version of the standard controller with a 3.5mm headphone jack and in Fall 2015 the high-end, $150 Xbox One Elite Controller was released. A lot has changed about the Xbox One from the time it was announced in May 2013. Microsoft had some fairly unpopular policies in place back then, but after listening to fans they have actually changed a lot of them. 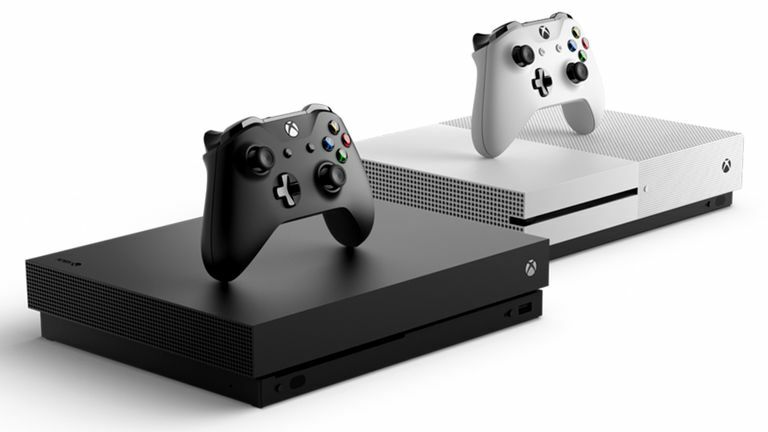 This has resulted in a fair bit of confusion for folks trying to keep track of all of the changes, but it has also led to the Xbox One being a much better system because of it with pretty much the same features and policies as the PlayStation 4. Here are the three main policies that people still have questions about. Yes, You Can Sell and Trade Games. You can buy and sell your retail game discs just like you could before on every other game system. The Xbox One works just like every other system. No, There Is No Mandatory Online Check-In. You don't have to keep your Xbox One connected to the Internet to check in constantly. You may have to connect it once to update the system software, but that's it. You can play entirely offline after that if you want. Of course, why you'd want to only play offline when there are so many nice features on Xbox Live is a bit odd, but the option is there if you want it. Kinect Is Not Required. You don't have to keep Kinect plugged in and turned on all the time if you don't want to. In fact, you don't even have to buy Kinect at all anymore and can save $100 on the price of the system. A key part of the Xbox One experience is Xbox Live. Connecting your system online to Xbox Live allows you to buy game downloads and watch videos, share your recorded gameplay videos, use Skype to talk to friends and family, keep track of your friends, achievements and game progress. In addition, you can play multiplayer games online with other people. If you want to play games with other people, you will need to subscribe to Xbox Live Gold. This subscription level gives you access to members-only deals and discounts on downloadable games, as well as free game downloads each month with the Games With Gold program. If you don't want to subscribe you can still use the Xbox Live Free service. You won't be able to play games with other people or get free games, but all of the other benefits of Xbox Live will be available to you. There are dozens upon dozens of video apps that you can use on Xbox Live such as ESPN, UFC, WWE Network, Hulu, Netflix, YouTube, and many, many more that you can use on Xbox One for no additional fees Subscription fees for individual apps will still apply, but you don't have to pay for Xbox Live on top of them just to use an app. Kinect on Xbox One is fully optional. Microsoft announced in late 2017 that it was discontinuing the product although some retailers might still have it on their shelves. You don't have to use it, and now you don't even have to buy it at all if you don't want to. Only a handful of Kinect games have been released for the Xbox One so far and, unfortunately, they have been pretty disappointing and actually worse than their 360 Kinect counterparts. The hardware itself is a vast improvement on the performance of the Xbox 360 Kinect, but the games have been very underwhelming so far. Also, the fact that it is no longer packed in with every system and is now optional means that fewer Kinect games are likely to be made in the future. Kinect does have some nifty uses outside of having to stand up and wave your arms at games, though. Many games use Kinect voice commands to do interesting things, such as using sound to get zombies attention in Dead Rising 3 or using the GPS system in the upcoming Forza Horizon 2, just for a couple of examples. Almost every Xbox One game has some sort of optional voice commands. Also, being able to instantly search for things, launch games or apps, turn your system on and off, or tell your Xbox One to record something cool that just happened in your game ("Xbox, Record That!") with voice commands is pretty cool and generally works well. Kinect isn't the gameplay revolution a lot of folks hoped it would be, but it isn't entirely useless, either. Now that you have an option of whether to buy it or not, thinking about how and/or if you'll use it is something to consider before making a purchase. The real draw of any game system is the games, of course, and the Xbox One has the best lineup of next-gen games available to buy now. Xbox One has fighting, racing, FPS, TPS, sports, platforming, action, adventure, and many more. In addition to traditional games from big publishers, Xbox One has a rapidly growing number of independently published indie games that are some of the most interesting and innovative games on the market. And these are actually good games, too, not junk like on the Xbox 360 indie game section. A nice touch is that there is no separation of Xbox Live Arcade or indie games from the main retail games on Xbox One. Games are games. Every game is available for download day 1 alongside its retail packaged brother (if available). Every game also has 1000 Gamerscore whether it is a retail game, indie game, or anything else. In Fall 2015, the Xbox One added backward compatibility with certain Xbox 360 titles. The BC feature on XONE works by emulating the X360 via software on the XONE, so essentially it is a virtual system within the XONE. This means that any game can and should work (except games that require you to buy extra accessories), unlike OG Xbox to X360 BC where each title required special updates to work. Games have to be approved by publishers before they can become BC on XONE, however, so don't expect every game to work. See our full X360 BC On XONE Guide here. One slight negative you have to consider about Xbox One is that it is less powerful than the PlayStation 4. This is a fact, and not up to debate. Games still look great on Xbox One and are absolutely a step above what we had on the Xbox 360, but they don't look as good or run as smoothly as PS4 versions of the same games. It isn't a huge difference, but it is there. If you really care about graphics, this is something to consider (though you really should be playing on PC instead since modern PC performance blows both PS4 and XONE out of the water). With all of that said, most people will be perfectly happy with the visuals on Xbox One. The games still look great, and unless you're looking at the PS4 and XONE version of a game side by side you probably won't notice or care about the difference. The Xbox One uses a Blu Ray disc drive, which means you can watch DVDs as well as Blu Ray movies with the system. You can control movies with either the XONE controller, Kinect voice and gesture commands, or buy an optional media remote. Just like the Xbox 360, the Xbox One has a full suite of family settings so you can control what your kids play (although you can make sure to buy kid-friendly games) and watch and for how long, as well as how and who and what they can interact with on Xbox Live. You also have full control over what Kinect sees and does as well, so you don't need to worry about it watching you (unless you want it to). The Xbox One installs every game entirely to the hard drive whether it is a retail disc or download (you still have to have the disc in the drive to play it, though, if it is a retail disc). The games can be pretty massive, too, which can fill up the 500GB hard drive of the Xbox One pretty fast. Thankfully, you can buy an external USB hard drive and connect it to the Xbox One for additional storage. Almost any brand and size will work, too. This way, you can add tons of extra storage for relatively cheap. You can always carefully manage the built-in hard drive and delete things when you need to in order to make room so an external drive isn't necessary, but it is nice to have the option.